As production on season 4 wraps up, cast members have been sending notes from the set. Today’s message is from Sam Trammell. Oh Sam! I wish I could!! I haven’t looked, but I wonder if the HBO shop has the postcards for sale. 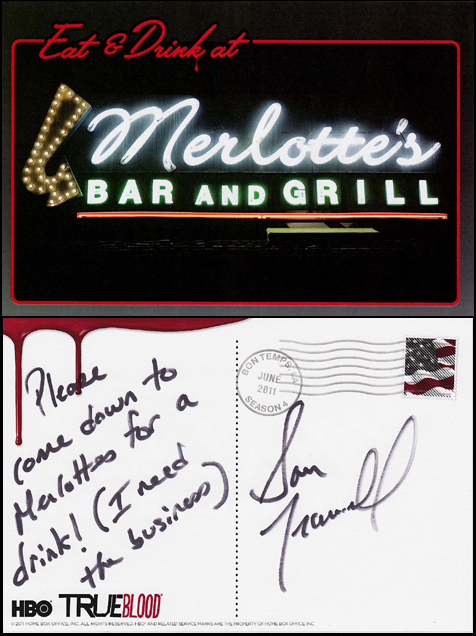 I would love to have a collection of postcards from the cast! And this one is so adorable – great idea. I will…only if you serve Red Stripe Beer. I’ll be there in a hot minute, Sam! Get a Samuel Adams ready for me!